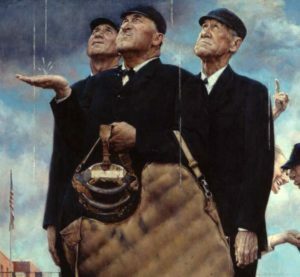 But that was over a half century ago, when purity and simplicity were traits to be admired, just like a Norman Rockwell painting. Those days are long gone. For today’s modern investor, it’s all about volatility. This includes trying to time the market by monitoring the CBOE Volatility Index (also known as the VIX, or “fear gauge”) and buying and selling volatility itself, which is easily done using a variety of products. For institutional investors, it also means hedging “tail risk,” while retail investors react by pouring their money into “low volatility” mutual funds and ETFs. It is true that there is a large overlap between measures of a secure dividend, high quality and low volatility over time. But as 2016 so clearly illustrated, high dividend paying stocks are subject to their own mini booms and busts. The message from Wall Street, the financial media, and academia is clear: Volatility equals risk. Following this faulty logic one step further, these pundits reason that a low-volatility environment now portends high risk in the future. They ignore the simpler truth: Volatility itself is mean-reverting. It’s all madness—just the latest financial fad that promises to achieve the unachievable: suppress volatility without also suppressing returns. Don’t buy it. The “volatility equals risk” movement was born in academia with the advent of modern portfolio theory, which was an investment theory based on the idea that risk-averse investors can construct portfolios to optimize or maximize expected return based on a given level of market risk, emphasizing that risk is an inherent part of higher reward. Modern portfolio theory (MPT), or mean-variance analysis, is a mathematical framework for assembling a portfolio of assets such that the expected return is maximized for a given level of risk, defined as variance. Its key insight is that an asset’s risk and return should not be assessed by itself, but by how it contributes to a portfolio’s overall risk and return. Variance … informally measures how far a set of (random) numbers are spread out from their mean. Mathematically, it is expressed as: Var (X) = E [(X – µ)2]. Allow us to translate and provide crucial context. Modern portfolio theory is a mathematical construct, and one needs to plug in numbers for both return and risk to make the equations work. Identifying a number for return is simple: It’s the average historical return of a particular asset. But until Markowitz came along, risk was a perception—a subjective expression relative to the anchor of permanent loss of capital. The legerdemain of modern portfolio theory was simply to define the fluctuation of an asset price (i.e., its variance or volatility) as “risk.” In other words, it’s no longer about a relationship relative to the erosion or permanent loss of capital; it’s now about movement itself. But is that really a fair way to define risk? It depends on your perspective. The safety of an asset class is its ability to preserve purchasing power over time. Thus, the relative safety or riskiness of a particular security or asset class can be measured by the reduction or accretion of purchasing power over time, not by short-term fluctuations in price. The only group of investors likely to be harmed by a temporary decline are recent retirees, and maintaining two years of living expenses in cash is the only hedge needed for this risk. Over time, stock prices are inextricably linked to the earnings and dividends they generate for their owners, though not at all precisely. They fluctuate. And the stock market historically has advanced over time, though not in a straight line. Conclusion: The volatile and asymmetric returns experienced over days and weeks are smoother over the course of months and years. Over the long term, volatility is more accurately defined as a measure of unpredictability rather than as a measure of risk. By way of demonstration, consider that since 1950, there have been 58 different 10-year periods (i.e., the 10 years from 1950-59, 1951-60, 1952-61, etc., all the way up to 2007-2016). 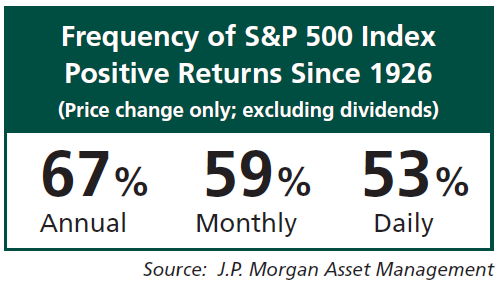 The S&P 500 has produced a positive total return in 56 of those 58 decade-long periods, or 97% of the time. If one extends the holding period to 20 years, the picture is even better. For equities, there has never been a 20-year period in the postwar era that has experienced losses. 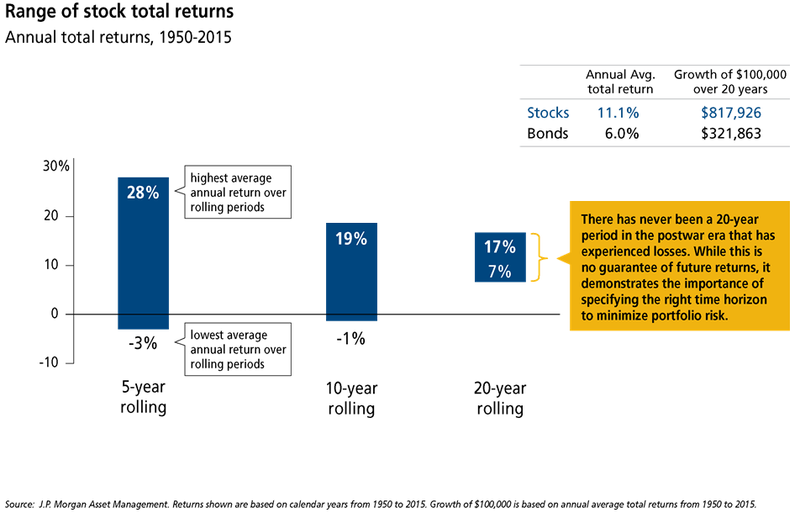 While this is no guarantee of future returns, it demonstrates the importance of specifying the right time horizon to minimize true portfolio risk. Further, it explains why it’s irrational to make an effort to minimize losses from temporary declines. Purchasing power. Preserving the dollar value of a portfolio is never an adequate goal, because inflation constantly erodes that value. With 3% inflation a year, the cost of living doubles every 25 years, and investors who merely preserve their principal will lose half their purchasing power over that time frame. The goal must be to preserve and grow purchasing power. Equities. Over time, equities—not bonds—have been the best way to preserve and grow purchasing power. Since 1926, equities have delivered a 7% real return for large-company stocks and a 9% real return for small-company stocks—double and triple the 3% real return for bonds. Volatility. Equities are more volatile than bonds, and the bumpy ride is the reason for the higher returns. But we don’t equate equity volatility with risk. Volatility is a short-term disturbance, whereas the long-term returns from equities are enduring. Equities are a good investment because they go down temporarily and up permanently. Temporary declines become permanent losses only when investors sell in a panic. Growth. Volatility is the norm in the equity market. Since the end of World War II, intrayear declines have averaged 14%, and there have been temporary declines of 15% to 20% about one year in three. Roughly one out of five years, there’s a bear market decline of 20% or more. Nonetheless, the equity market is now more than 70 times higher than it was in 1946, and dividends have increased by a factor of 40. The real risk for equity investors is not volatility; it’s their emotional response to volatility. All of us have an innate tendency to interpret large temporary declines in the market as the beginning of the end. And when we panic, we flee. Investor behavior—not investment performance—drives the financial outcomes experienced by most investors.